Everyone seems to be going crazy about the New 52 and I have had mixed emotions, but like most fans, I can roll with the punches. First, this title is written by Geoff Johns and at this point all I can say is virtually anything this man writes is excellent stuff. This issue doesn't fall short of that either. The artist, Doug Mahnke, does some really tight work, and certainly does Green Lantern justice. 1. In Justice League #1 (also written by Johns), Hal Jordan is the Green Lantern, and in this one, he's not. 2. I can't really wrap my head around how everything else has changed in the DC universe but this has stayed the same. Inconsistencies aside, the book starts where Green Lantern #67 left off. 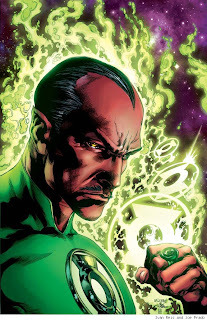 Hal Jordan has been outcast from the Green Lantern Corps, and his replacement, as chosen by the Sentient Ring, is none other than Sinestro. This comes as quite a twist to the Green Lantern series, because Sinestro is the leader of the yellow fear-wielding Sinestro Corps! Sinestro is not pleased to be wearing the ring at all, and demands the Guardians remove it. Of course, in their infinite wisdom, they disagree and handle the situation with a "deal with it" attitude. They do say that Sinestro isn't expected to listen to the Guardians, but is expected to protect his sector. Strange. After overhearing what sounds like a bully beat-down on a woman, Hal jumps off the balcony of his apartment, which is seven stories high, down to the adjacent apartment to help. As he crashes through, he discovers it's all a part of a movie set. Oops. Off to jail for Hal. Back on the Sinestro front, we find him observing Korugar from an asteroid with a manifested telescope. He sees that the Sinestro Corps is enslaving the planet and not being very nice. That's when a Sinestro Corp member attacks him from behind. After realizing it is Sinestro, the Corp member contacts Arkillo to rat him out. Bad move. Sinestro kills the guy, destroys the yellow ring, and retreats. Very interesting! After an interesting night out, Hal returns home only to find Sinestro waiting, with a very hard offer to refuse. Just found out that Justice League #1 is actually 5 years prior to now, so the inconsistency no longer holds with Hal having the ring in JLA#1 and Not on GL#1 Still interesting.